I want to talk about barriers to successful grilling. See, for 9 of the past 10 years we have tried--key word--to be successful at grilling. Our grill is the largest tiny portable one there is, and it has a nice loop to hold a tiny propane tank (the kind a restaurant might use for creme brûlée). Each time we wanted to grill out, we'd carry the grill out of the shed, set it up, preheat, put the food on the hot grill, and then . . . when it was time to turn the meat, the small propane tank was empty and the grill was cooling. When this scenario is played out often, it makes you want to just crank up the oven and heat up the house! Last summer I decided to tackle our grilling barrier head on. We got a standard size propane tank, one that has to be carried separately from our little grill. Finally I could trust that when I started the fire I'd be able to see the cooking through, and with that our grilling changed. We do store our grill in the garage (because we've since moved to a house with a garage) so once it's hauled out and set up I like to grill anything handy and used the grilled items in future meals. I've used this technique in my Grilled Veggie Ciabatta Pizza, but now I'd like to share a terrific picnic side dish or light summer supper: Pasta Salad with Grilled Fruit and Goat Cheese. At its heart this a recipe for macaroni and cheese, so it's no surprise that I got the recipe from MELT: The Art of Macaroni and Cheese (link to the author's website). I received a copy of this terrific cookbook last fall and have made several recipes with it, including Macaroni and Cheese in a Pumpkin and Pumpkin Cranberry Maple Kugel. 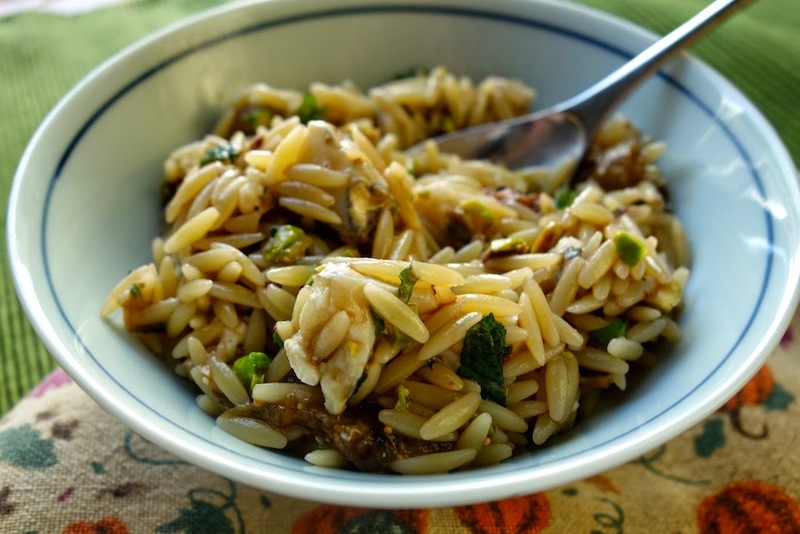 One of the first recipes that caught my eye was an orzo salad with Humboldt Fog goat cheese and grilled peaches. 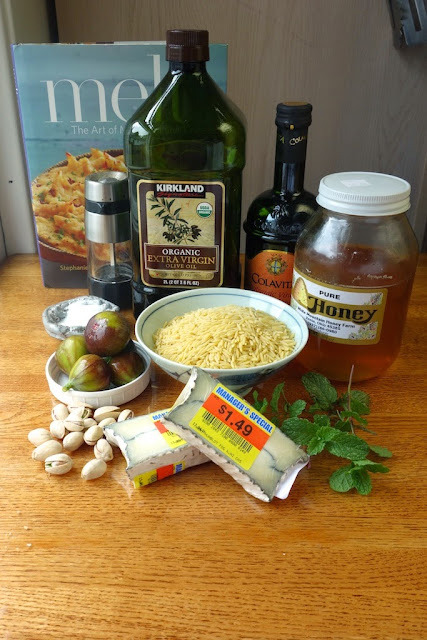 Since I eat seasonally I figured I'd need to wait until peach season to try it--but first I found myself with some fresh figs at the same time I found Humboldt Fog marked down at the fancy cheese counter. Score! This tasted so yummy that the name--Humboldt Fog--stuck, so since then I'm always on the lookout for it in the marked down bin. The next time I came across the cheese coincided with cored pineapple selling for the same price as whole pineapple. I prefer not to pay for the parts that just go into the compost anyway, so I picked up a container of prepped pineapple. While we had the grill going for steaks, I whipped up the marinade and tossed the pineapple in to coat. I was out of orzo, so I subbed in elbow macaroni. 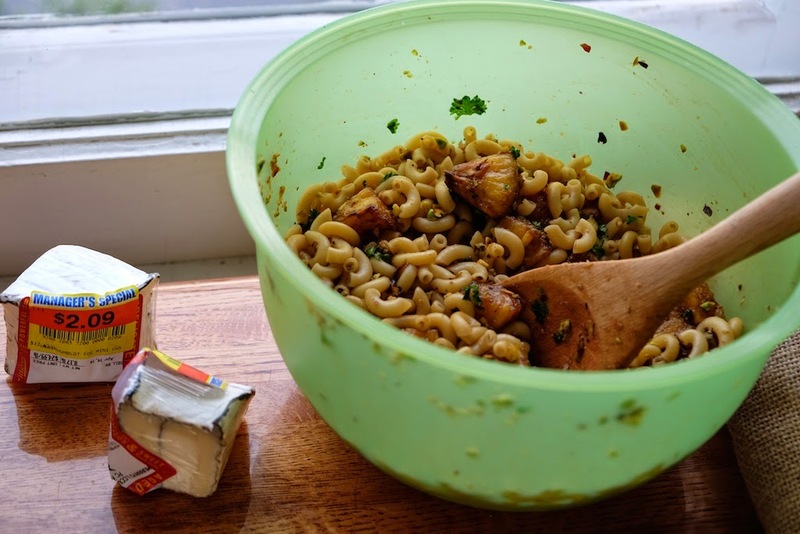 This savory-sweet pasta salad is a refreshing addition to summer meals. We prefer it served freshly tossed or at room temperature (do not microwave to reheat the leftovers). 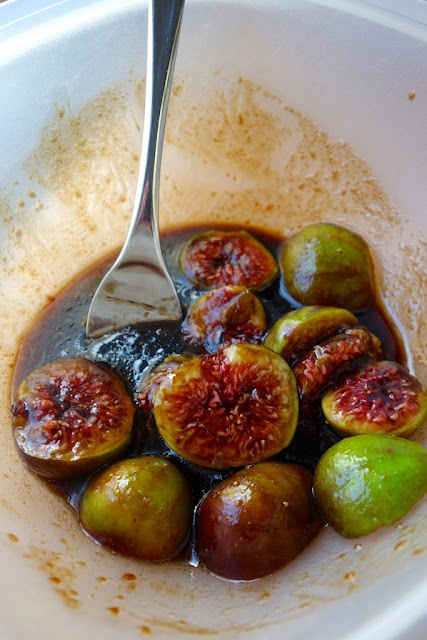 For more recipes using figs, please see my Fig Recipes Collection. For more recipes calling for fresh peaches, please see my Peach Recipes Collection. For more recipes using pineapple, please see my Pineapple Recipes Collection. These collections are part of the Visual Recipe Index by Ingredient, a resource for folks like me eating from the farm share, the farmer's market, the garden, the neighbor's garden, and great deals on ugly produce at the grocery store. Note: I can vouch for grilling figs and pineapple in this salad, and I utterly trust Stephanie's and Garrett's recommendation of grilled peaches. I'd guess that roasting strawberries or raspberries would also go nicely. 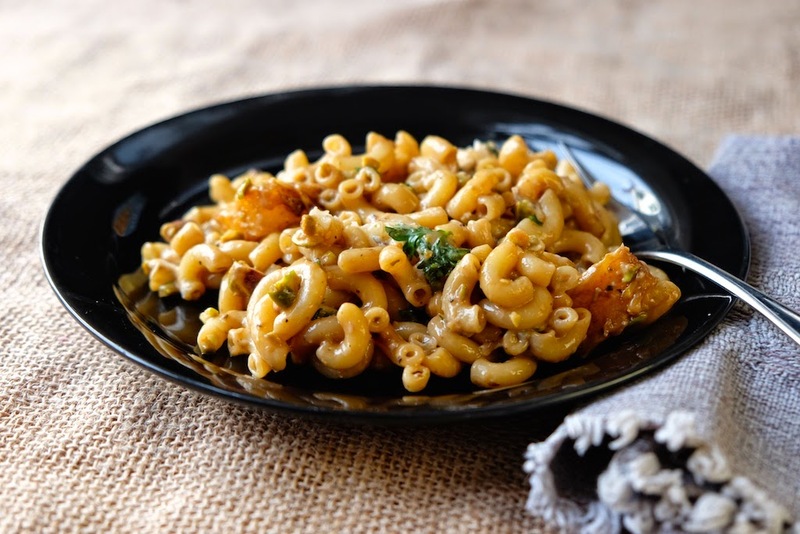 As for pasta shapes--anything little seems to work well. In a large size bowl mix together honey, balsamic vinegar, olive oil and ¼ teaspoon salt. Toss fruit with marinade and set aside for 10 minutes while you preheat grill to medium heat. Prepare pasta according to package directions, drain, and set aside. Once the grill is hot, remove the fruit from the marinade, reserving marinade in bowl. Grill the pineapple (or figs, or peaches) for 5 to 10 minutes, turning after a few minutes to get char marks on both of the cut sides of the pineapple. Cut into bite sized pieces and return to the bowl. Add cooked pasta, herbs, nuts, pepper and another ¼ teaspoon salt. Toss together. Scatter cheese over top, toss gently to combine, and taste--add additional salt or pepper as necessary. Delicious slightly warm or at room temp. What are some barriers to grilling that you've overcome? I'm so glad for you--with space at a premium little and charcoal does the trick. We're debating a new grill, with a burner on the side. I may never turn on the oven when it's over 80 degrees outside. Thanks so much for the feature! I appreciate it! You just combined some of my favorite items: fruit and cheese. I even have peaches in my freezer, although the Hubby is working on prepping the grill for the season. The whole thing needs to be cleaned, a disgusting job so I'm thrilled he's tackled the project. This pasta salad looks and sounds incredible delicious. I can't wait to try it. I won't say that we're buying a new grill to avoid cleaning . . . but . . . well, we're not. It's actually pretty clean since we keep using it. 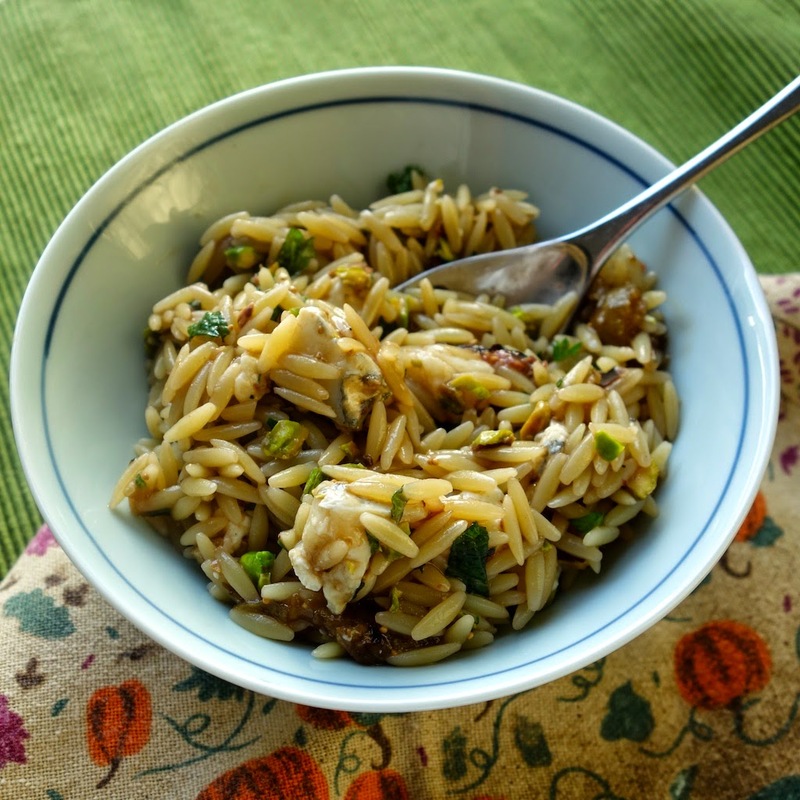 I think you'll love this pasta salad. 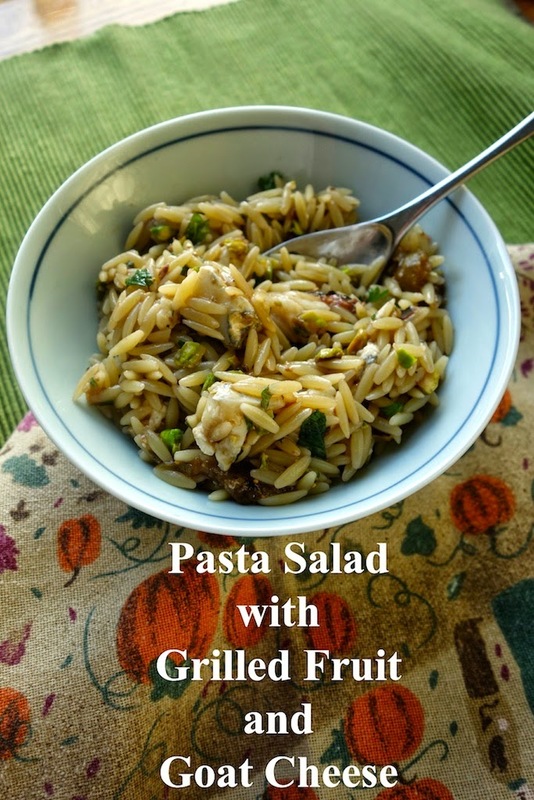 Hmmm, I've never thought of adding fruit to my pasta salad, but I bet it tastes great. Thanks for sharing with us at Simple Supper Tuesday. I'm always looking for tasty and easy and cool salads for summer. Thanks for hosting!